Today you may need to work on directing your attention to one (or two) clear goals rather than allowing your energies to scatter. You may be frustrated with occurrences that catch you off-guard and by your inability to act as quickly as you feel you should. 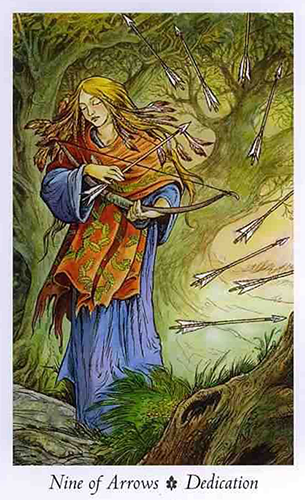 The Five of Arrows is the Wildwood Tarot’s version of the Five of Swords, a card that’s often linked with discord and hostility. And there is some of that here, although it’s less the “me against the world” mentality that’s usually seen in this card, and more about being your own worst enemy. Are you worried about missing out on an important opportunity, or afraid that when one does present itself you’ll end up missing the mark? Or perhaps you’re frustrated by your inability to see your target clearly in the first place. This is the predicament the figure in this card finds himself in. He knows he needs to act quickly, but it’s clear that flinging his arrows in every direction but the one that counts isn’t going to land him the prize. He’s shot four arrows and all of them missed. Will he get it right with his fifth and final arrow? The answer depends as much on his willingness to see where his inability to focus has tripped him up in the first place. And this is something you want to keep in mind today too. You may have to look at where your own impatience and frustration have prevented you from reaching your goals in the past, and then think about how you can do things differently moving forward. You’ll get much better results by focusing your energy in one clear direction than you will by flinging it haphazardly into the air. 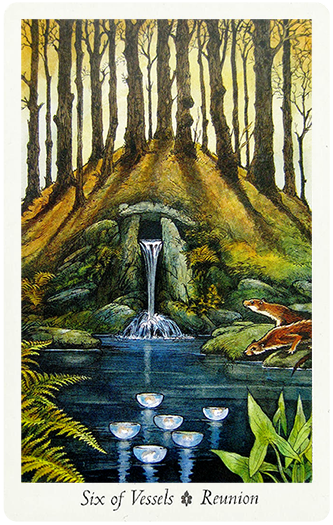 Today’s card — the Six of Vessels from the Wildwood Tarot — is this deck’s version of the Six of Cups. It’s a card of innocence and purity, pristine beauty and a joyful, lighthearted playfulness that is seen in the pair of otters who are just getting ready to test the waters. This is clearly a sacred space which picture postcard beauty made up of lush foliage, a trickling waterfall, and six glowing bowls that float on the surface of a tranquil pool like a scattering of lotus blossoms. A grove of trees springs up from a hill in the background, shielding this scene from the rest of the world. And this in many ways is the essence of the Six of Vessels. This card is called “Reunion” in this deck, a reference perhaps to reuniting with your true purpose. Getting in touch with your childhood, your roots and yourself. The Moon is in Capricorn today, conjuncting Pluto at some point and trining Venus, Mars and Jupiter. All of this Earth energy (the North Node is in Virgo now too — another earth sign) can awaken in you a desire to get back in touch with nature. Take some time today to find your own sacred space; and reflect on the things that have brought you to where you are today. If you can’t get away you can still recapture some of the magic of those simpler times, and use it to restore your sense of peace. Today is a day for going after your heart’s desires with the kind of purpose and agility that can take you as far as you’re willing to go. This is the Wildwood Tarot’s version of the Knight of Cups, the card that is generally associated with a man who’s ready to fall in love and who’s not afraid to wears his heart on his sleeve. In this version it’s the Knight of Vessels, portrayed by an eel, weaving in and out of danger as he glides toward his objective. 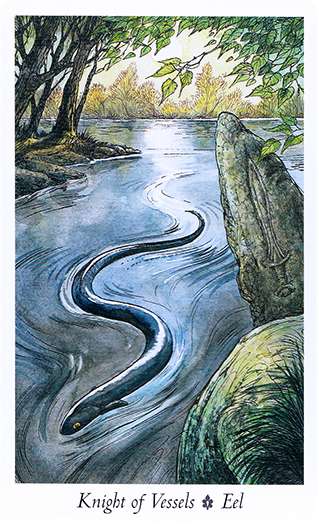 As a water spirit animal totem, the Eel is representative of the Kundalini life force energy. It’s associated with focused energy, creativity, sexuality, passion and transformation. The Eel is a mutable and “electrifying” shapeshifter. He’s purposeful and swift, yet he glides through the water (emotions) with such ease and agility that he’s able to adapt his physical form to accommodate the ever-changing tides. The Knight of Vessels invites you to adopt this same sort of adaptability as you go off chasing your own goals. It invites you to weave in and out of the opportunities to present themselves, steering clear of “danger” while moving effortlessly toward your own objectives. You may be thinking about going off on an adventure; if so don’t be surprised if it includes romance. Alternately you may be planning a trip on your own, getting away from it all, or heading off into the unchartered territories. Whatever you decide, this card calls for you to unleash your power and go after your goals with the same kind of purpose and passion that is demonstrated here. Look at that great big Full Moon the Wolf is howling at in this card. It’s also a Blue Moon and a Super Moon, loaded with Myth and Magic. 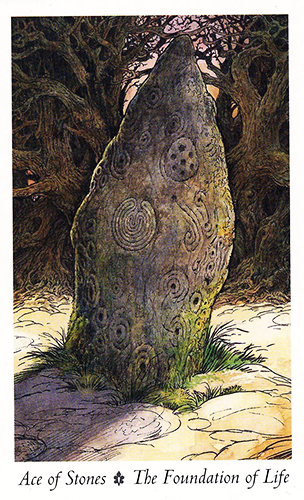 The King of Stones is the Wildwood Tarot’s version of the King of Pentacles. He’s an authority figure, a boss, parent, or mentor. 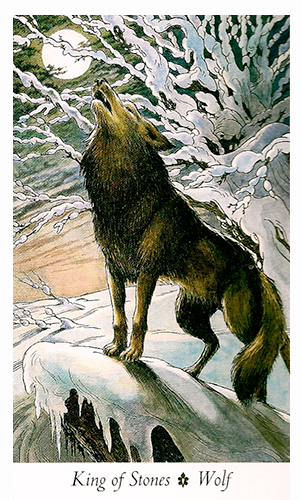 He’s a natural leader — whether he’s leading a pack or acting as a lone wolf, as seen in this card. He knows how to make his presence known without causing too big a ruckus. He may seem imposing but his bark is generally worse than his bite. He’s a steadfast and solid individual who refuses to back down. The King of Stones also knows how to protect his assets. Whether this relates to material possessions or his family and loved ones, he’s known for being territorial. He’s not about to let anyone to trifle with what he has. Whether this is someone in your life or an attitude that you need to adopt, the King of Stones is here to teach you the importance of letting your intentions be known. This isn’t the time to cower in the shadows. It’s time to step up and mark your territory, without stepping on anyone’s toes. Today’s Full Moon is in Pisces, which brings in the idea of following your dreams. There’s a gentler edge to this Moon which makes it more about finding your inspiration that blindly accumulating trinkets. Take some time to figure out what you want, and then go after it with the determination and enthusiasm that gets you howling at the Moon. With Mercury trining Saturn today, it’s a good time to gather information that may be useful for you down the road. 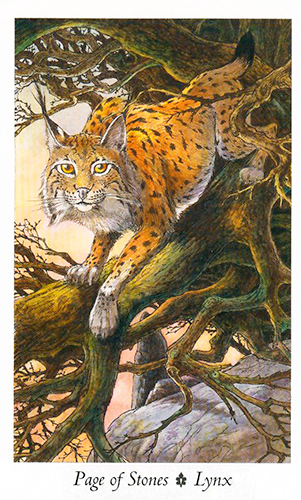 The Page of Stones — the Wildwood Tarot’s version on the Page of Pentacles — is known for being patient and diligent, much like the Lynx in this card. He’s watchful and attentive but not quite ready to pounce. He relies on his instincts — and all five senses — to alert him to danger before it has a chance to strike. He’s conscious of every sight, sound, smell and movement in the wilderness around him, from the safety of his perch. The Page of Stones is more intent on focusing and observing than he is on acting or doing: he’s not about to expend any excess energy unless it becomes absolutely necessary. Of all the Pages in the Tarot, this one is most capable of biding his time and exercising restraint. He’s still got some growing to do. He still isn’t where he hopes to one day be. But he knows that good things come to those who wait and that he may have to conserve his energy in case he needs it later on. He also knows that if he needs to act he can because he’s secured his position and made the appropriate preparations. He doesn’t quite blend into his surroundings but he’s compensated for that by placing himself out of harm’s way. The Mercury / Saturn trine is similar in that it emphasizes forethought and preparation, especially as these two planets are in water signs which means they’re more primitive and instinctual than aggressive or action-oriented. This aspect is especially good for planning and information-gathering, which could serve you well today — especially if you can see yourself putting those plans into motion and acting on them down the road. 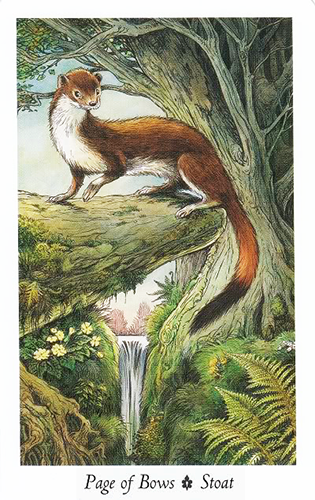 Today’s card is the Stoat (or Page of Bows), which is the Wildwood Tarot’s version of the Page of Wands. This is a ferret-like creature that is prized for its Winter coat — pure white (save for the black portion of its tail) in some Northern regions — and despised for its invasive practices in others. Here he looks out from a moss-covered outcropping, alert and attentive and ready to pounce if necessary. Like the Page of Wands, the Stoat is ready for action and fast on his feet. He’s a predator but also somewhat defenseless. He’s just as capable of being someone else’s dinner as he is of capturing his own, hence the need for impeccable reflexes. But the Page of Bows is wily. He has a multitude of options available to him. He can pounce from his perch onto the ground below; he can scurry up a tree, he can stretch his limber little body out and slink off into the bushes, or he can shimmy down a hole never to be seen again. This is the kind of flexibility you wan to have today as you are met with various challenges. You want to think about all of the resources that are available to you. And you want to think about what it is you can do that makes you unique. What skills do you possess that make it easier for you to avert danger and take advantage of opportunity? Mercury trines the North node today and sextiles the South. This transit can make communicating your needs to others a bit easier, while at the same time allowing access to strategies and solutions. You may seem harmless, like the adorable little Stoat in this card. But remember that you do have a vast array of options at your disposal for getting what you want today. in exactly the way that you want it. Venus trines Saturn today and brings with it the discipline and dedication to see your way through difficult times without losing focus. The Nine of Arrows is the Wildwood Tarot’s version of the Nine of Swords, a card traditionally associated with fear and paranoia. But look at the woman in this card. She moves so deftly through a firestorm of flying arrows that she doesn’t even notice them whizzing by her head. In fact her eyes aren’t even open. This card is called “Dedication” and speaks of the need to stay on your path and not allow yourself be discouraged by potential pitfalls or distractions. The woman may seem like she’s not paying attention, or is just going through the motions. Or she may be so dedicated to her craft (notice she holds the bow and arrow in her hands like it’s a musical instrument) that she’s undeterred by the threat of danger on her path. The Nine of Arrows in this deck speaks of heeding your calling and dedicating yourself to your life’s work. Whether that refers to a specific gift or talent, or whether it refers to a spiritual undertaking, you’re encouraged to devote yourself to it fully and not allow yourself to be deterred by whatever challenges threaten to stand in your way. The Venus / Saturn trine makes that vision clearer to you — so clear in fact that you don’t have to “see” it to believe in it. But you still have to do the work. And that means mustering up the courage and dedication to get started on your path. Coming on the heels of yesterday’s Star card — and its relationship to how and where you fit into the cosmos — today’s Solar ingress into Taurus brings you back down to earth, shifting your focus to the tangible, manifest world. 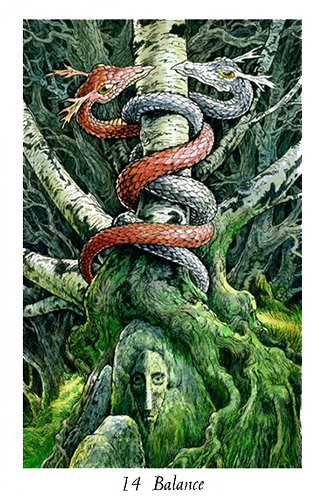 The Ace of Stones — the Wildwood Tarot’s stunning version of the Ace of Pentacles — is all about establishing your foundations and finding your place in the material world. It’s about getting grounded, interacting with nature and reconnecting with the Earth. You may be focusing on mundane concerns today, such as developing a craft, earning a living, and preserving what you’ve acquired over time. The Ace of Pentacles is traditionally associated with money (and new money coming in). But this about way more than that. This Ace of Stones is a living breathing rock. It emerges from a barren landscape and points toward the sky (consciousness). The patch of grass at its base speaks of growth and new beginnings, while it’s lichen-covered surface reminds you that it’s stood the test of time. The intricate symbols etched into the Stone are cup-and-ring marks dating back to prehistoric times. They affirm the presence of mystery and ancient wisdom that is a part of our heritage. Today you may be thinking about your roots, your history and the foundations of your existence. You may be looking about how far you’ve come as you plan your next moves. The Ace of Stones — like the Ace of Pentacles — refers to new opportunities that are rooted in your past. It tells you it’s time to put your goals into action and turn your thoughts into concrete plans. The Ace of Stones says the time is right to take what you’ve learned and developed over time and make it manifest. The Sun conjuncts Mercury today (in Aries) — bringing with it the impetus to deliver messages swiftly and with conviction. You have something to say? now is the time to say it! 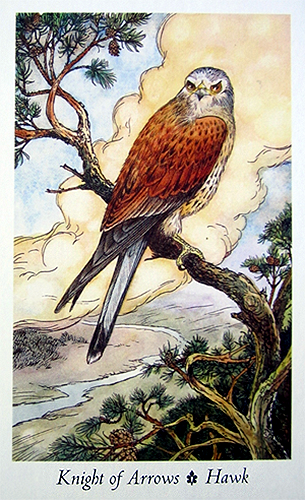 The Hawk (Knight of Arrows) — Wildwood Tarot’s version of the Knight of Swords — is a messenger bird, said to be the conduit between Sky and Land. It glides swiftly over mountaintops and swoops down deftly over land and sea to capture its prey. As an animal totem the Hawk is known as the messenger to the Spirit World. It represents focus, vision, dexterity and acumen. It soars to great heights and dives to great depths. It hovers, watches and analyzes before going in for the kill. You may have an important decision to make today and an equally important message to deliver. You may be preparing for a presentation of searching for just the right words. You’re probably not going to feel too much like dilly-dallying. The Sun / Mercury in Aries is much more inclined to “spit it out” than chew it over. But keep in mind that this conjunction is also what’s known as “combust” — referring to the phenomenon of the Sun’s bright light obscuring Mercury from view. This can manifest as increased frustration and agitation, especially where communications are concerned. Much like the Knight of Swords, there’s a sense of impatience or urgency to make things happen and because of this you want to remember to temper your communications today with tact and diplomacy. While you will undoubtedly have much to say, you’ll much better results — and much more cooperation — if you say it with courtesy and sincerity. Mercury goes direct today in the earliest degrees of Aquarius. This is the sign associated with lighting-fast insights and discernment. It’s capable of rising above and looking at things from an impartial and objective perspective, much like the King of Swords. 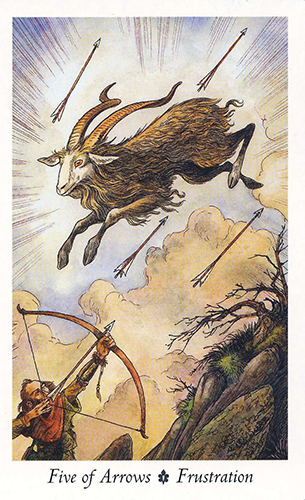 This is the Wildwood Tarot’s version of that card — called the King of Arrows in this deck. Here we see him soaring high above a crystal clear body of water, its surface so pristine it looks like a mirror. This is in keeping with the King of Arrows’ / Kingfisher’s penchant for clarity and altitude, as well as the searing precision that’s needed to go after his prey. He flies high enough to get a clear overview of all the fish beneath the surface, and when he finds what he’s looking for he nose dives after it, plucking it from the depths with barely a ripple left in his wake. The King of Swords is traditionally a rather stoic individual. He’s intelligent, articulate, moral, fair and just. He doesn’t mince words and he doesn’t suffer any fools. He has honor, integrity and principles, all of which he’s unlikely to yield. If this is someone in your life (boss, mentor, parent, etc.) you’d do well to heed his advice. He may just offer you a perspective that you hadn’t considered. But it can also indicate qualities you need to embrace. 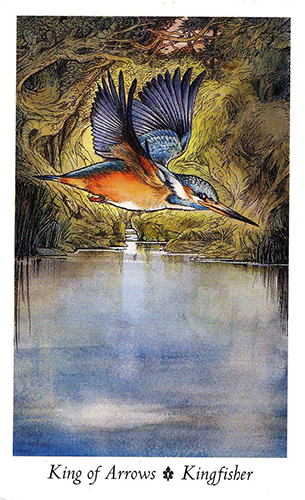 What is it about the Kingfisher that you could incorporate into your decision making options today? What about clarity, precision and altitude? What about flying high, getting an overview and looking at things from a different perspective? 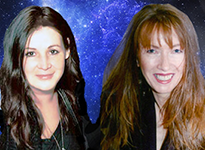 With Mercury turning direct today it’s time to start being decisive and thinking ahead. It’s time to clear away the debris and work on attaining better focus. And it’s time to take a leaf from the Kingfisher’s book and rising above it all. All good things come to pass and new things take their place. With the Moon conjunct Pluto today there is a sense of transformation around and with these two planets it’s more than likely having a tad more than a bit to do with emotions. This aspect denotes intense emotions. They type of emotions that you may try hard to get away from. They do not merely sway you they knock you off your feet. Added to this Venus is squaring nodes so a sense of fate steps in today making situations more intense and once again Venus is linked to emotions so we have a volatile day for your love life. An emotional rollercoaster of emotions that you just can’t seem to get away from. You may find thoughts going and around and around in your mind and you are picking over old bones in an effort to come up with answers. This however may not be the best way to go about trying to fix things and as it is possibly time to look at yourself, where you stand and what you want. Others will not be co operative today and you could find that who you once thought was a friend or lover has simply flown off leaving you to mull things over. Decide what you want and what you are going to do about it. 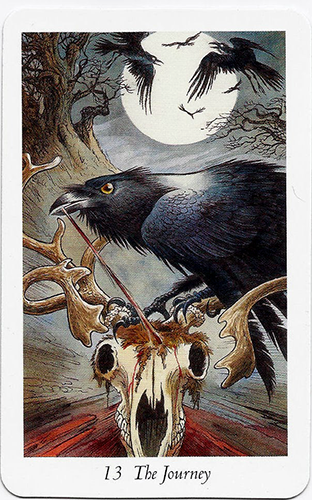 The card of the Wanderer in this tarot deck is more commonly referred to as the Death card in traditional decks. The Death card is a card of change and transformation. What change can you make today that will transform your life tomorrow? With Mercury in close contact with the Sun in Sagittarius today there is a need for balance and the possible need to reign in any actions that may get out of hand. The dragons in this image are in perfect harmony and both balance the other perfectly like night and day. They arise from the base of the tree like kundalini energy illuminating what is around for you today. Take note of the face underneath the tree. There is an ancient quality to this face which speaks of wisdom accumulated through life experiences and the ability to balance this wisdom in areas of your life without going overboard or holding back. Mercury is also trining Jupiter today which while it gives you excellent communication skills it also may be that Jupiter throws this out of balance and more communicating is done than you first intended. If this is the case or you feel as if you are going to say more than you wanted to then you need be clear in your own mind the parameters of any conversations otherwise you may put your foot in it which takes the balance of power from you in a situation and inadvertently gives it to the other person. Remember there is wisdom around for you today. It is a wisdom that speaks of the past and what has gone before. It is a wisdom that says you don’t need to act you can sit back planning and thinking your way through things. And if all else fails Jupiter is the planet of luck… so you can’t do much damage!